America’s oldest navy and marine installations are just blocks from where you are standing. This is the northern edge of a Capitol Hill community shaped by the presence of the U.S. military. Eighth Street is its commercial center. The Washington Navy Yard anchors the far end, where Eighth Street meets the Anacostia River. At this end, just one block from here, is the Old Naval Hospital. And halfway in between is the Marine Barracks, home of the United States Marine Band and inspiration for a local boy who made good: John Philip Sousa. 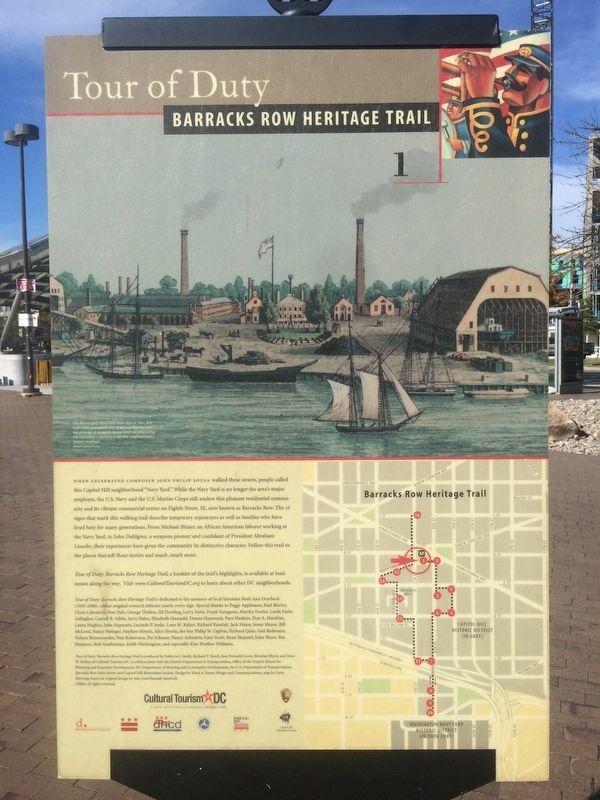 Eighth Street was planned as a commercial avenue leading to a natural harbor on the Anacostia River, where city designer Pierre L’Enfant designated a future trade center. But in 1799 President John Adams decided instead to give the site to the Navy for its Washington shipyard. Either way, Eighth Street was destined to be a street of business. In 1801 President Thomas Jefferson added another military installation: the Marine Barracks at Eighth and I Streets. Soon, as the Navy Yard became a major employer, small businesses emerged along Eighth. nation. As you walk this trail, you’ll see a variety of 19th- and early 20th-century building styles. 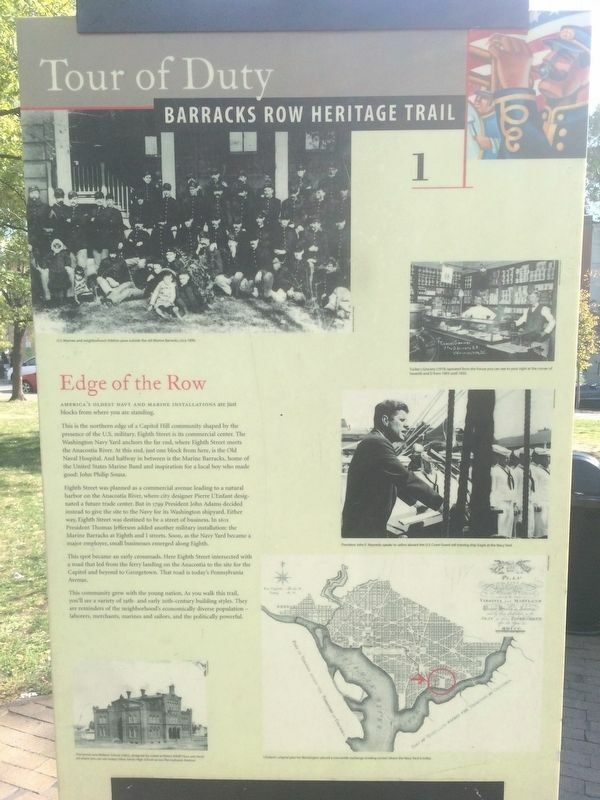 They are reminders of the neighborhood’s economically diverse population – laborers, merchants, marines and sailors, and the politically powerful. U.S. Marines and neighborhood children pose outside the old Marine Barracks, circa 1890. Tucker’s Grocery (1919) operated from the house you can see to your right at the corner of Seventh and D from 1903 until 1935. President John F. Kennedy speaks to sailors aboard the U.S. Coast Guard sail training ship Eagle at the Navy Yard. L’Enfant’s original plan for Washington placed a mercantile exchange (trading center) where the Navy Yard is today. The brand-new Wallach School (1863), designed by noted architect Adolf Cluss, was located where you can see today’s Hine Junior High School across Pennsylvania Avenue. 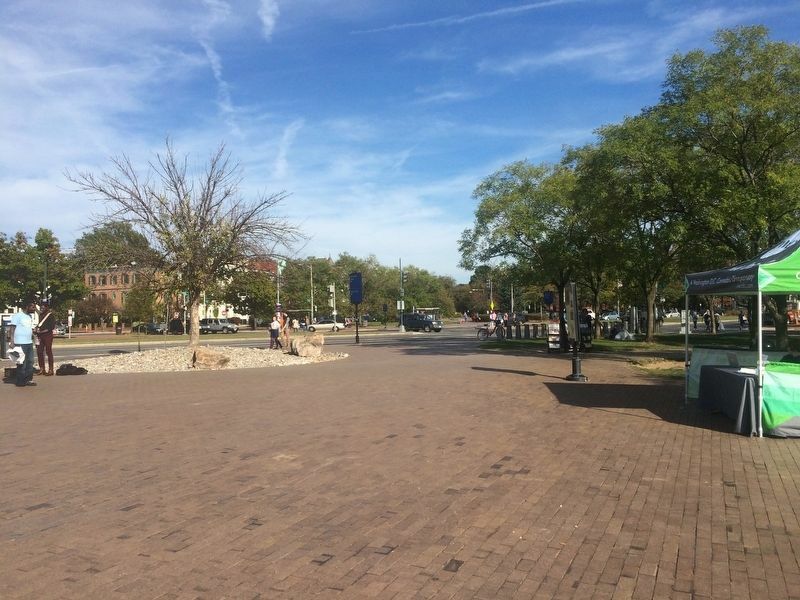 The marker is to the right in this view of Market Park. as well as families who have lived here for many generations. From Michael Shiner an African American laborer working at the Navy Yard, to John Dahlgren, a weapons pioneer and confidant of President Abraham Lincoln, their experiences have given the community its distinctive character. Follow this trail to the places that tell these stories and much, much more. Caption: The Washington Navy Yard, seen here in 1862, first built ships and tested ship designs before becoming a center of weapons design and manufacturing. For more than a century, it was the neighborhood’s largest employer. Location. 38° 53.04′ N, 76° 59.732′ W. Marker is in Capitol Hill, District of Columbia, in Washington. Marker is on Pennsylvania Avenue Southeast east of 7th Street Southeast, on the right when traveling east. Touch for map. The marker is roughly in the middle of Market Park, some steps south of the Eastern Market Metro entrance. Marker is in this post office area: Washington DC 20003, United States of America. Touch for directions. Other nearby markers. At least 8 other markers are within walking distance of this marker. At the Crossroads (within shouting distance of this marker); Commerce and Community (about 600 feet away, measured in a direct line); Healing the Wounded (about 700 feet away); Meet You At the Market (about 700 feet away); The Old Naval Hospital (approx. 0.2 miles away); Life on the Park (approx. 0.2 miles away); Eastern Market (approx. 0.2 miles away); A Neighborhood For Everyone (approx. 0.2 miles away). Touch for a list and map of all markers in Capitol Hill. More. Search the internet for Edge of the Row. Credits. This page was last revised on March 14, 2019. This page originally submitted on December 1, 2016, by J. Makali Bruton of Querétaro, Mexico. This page has been viewed 165 times since then and 11 times this year. Last updated on March 7, 2019, by Devry Becker Jones of Washington, District of Columbia. Photos: 1, 2, 3. submitted on December 1, 2016, by J. Makali Bruton of Querétaro, Mexico.